paint the rainbows ★彡: Holo Leopard Nails! Hello all! Today I have some fun leopard print nail art to share with you. 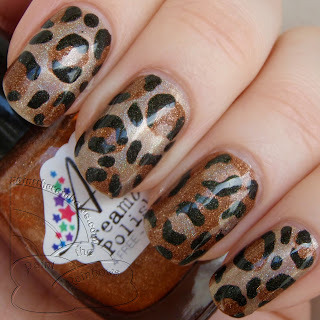 I have done leopard nails before, but never traditional real leopard-looking ones, so this was a fun look to try out. For the gold base I used Dollish Polish Squirrel!, a soft gold linear holo. Since I was trying to match my mani to some leopard print leggings I wanted to wear, I had to mix the perfect brown color since I didn't have the exact shade, so for the brown, I used a mix of Aly's Dream Polish Copper, a copper scatter holo, and Chirality Nail Polish I Got a Rock, a brown linear holo. I then just drew on the spot outlines in Aly's Dream Polish Super Black, a black scatter holo. I think it turned out really cool, take a look! Very fun mani! 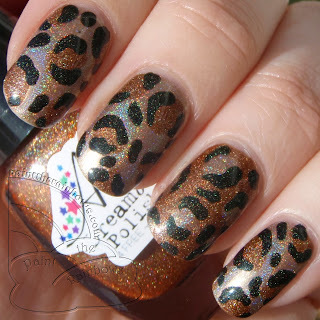 Looking back at all my old leopard print nails it's nice to see I've improved, haha. And of course it is always fun to match your mani to your outfit! Don't know how you do this. Very fun! !